WHERE CONTEMPORARY MEETS VISION, SOUND AND ACTION. A TALK SHOW FOR GREAT MINDS THAT CREATE, INSPIRE, AND EVOLVE. SUNDAY THROUGH SUNDAY LISTEN LIVE AND ON DEMAND TO CALL IN SPECIAL GUEST INTERVIEWS FROM ALL OVER THE WORLD, LIVE PERFORMANCES, IN STUDIO INTERVIEWS AND LIVE ON LOCATION REPORTS. THE HOST AYANNA, IS WISE AND A HUMOROUS BREATH OF FRESH PODCASTING AIR, AS SHE HAS CREATED AND PRODUCED A SIX SEGMENT SHOW PROVIDING A CULTURAL RENAISSANCE PLATFORM THROUGH :THE ... See More PLATFORM, COMING TO THE STAGE, THE CULTURE CLIMATE, THE TOUR, THE LAUGH LINE AND THE SEARCH EFFORT WITH KINGDOM CHILD RECORDINGS AS EXECUTIVE PRODUCER. THE FOCUS IS STRAIGHT TALK, ENCOURAGEMENT , MAKING THE KNOWN-KNOWN AND NO RECKLESS ENTERTAINMENT JUST RESPONSIBLE LISTENING NOURISHMENT. WITH A DEGREE IN SPEECH COMMUNICATIONS AND A PROFESSIONAL RECORDING RESUME AYANNA IS BREAKING SOIL AND SOWING SEEDS IN THE PODCASTING INDUSTRY! 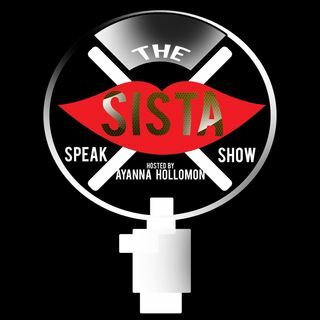 Explicit THE SISTA SPEAK SHOW : I AM BACK !With More Power!